Sweet dumplings, a favorite of Lord Ganesha, a special offering on Ganesh Chathurthi. Let’s make the filling first. Dissolve the jaggery in water and place it on the stove. Let the jaggery melt. Strain this solution to remove impurities. Heat this in a thick bottom pan until the jaggery syrup becomes frothy and thick. Add grated coconut. Mix well until the mixture turns thick. Turn off and add cardamom powder and sesame seeds. Tip: Always make the filling first then make the dough for the outer covering. This ensures that the rice dough does not get dried up. Now, to make the dough for the outer covering, follow either of the two methods. Method 1: Wash and soak the raw rice in 1 cup of water for at least 3-4 hours. Drain the water and set it aside. This water can be used while grinding. In a mixer, blend the soaked and drained rice into a smooth paste. You may add small quantities of the water that was used to soak the rice. You need to ensure that the ground rice is a very smooth and lump-free paste. Heat a heavy bottomed wok and add a cup of water into it. Bring it to boil. Add a speck of salt and 1/2 a tsp of oil to this water. When the water is bubbling and hot, turn the flame to low and gently pour/transfer the finely ground rice batter. Keep stirring while you do this. Parts of the batter starts to thicken and you would need more strength to stir the mixture. Keep stirring, turning the batter to all sides. Do not take your attention away even for a second or the batter will stick to the bottom of the vessel. In about 3-4 mins, you will notice that the batter has become a thick and soft lump. Turn off the fire. Close the vessel with a lid and keep it aside for about 5 minutes to let the dough be cooked in residual heat inside the vessel. After 5 minutes, remove the lid and using the ladle, mix the dough well and transfer it to a large bowl/plate. Use your hands to knead the dough while it is still warm. Grease your hand with a dab of sesame oil and knead the dough to a smooth and pliable dough. Cover with a wet cloth or air tight lid. This is to prevent the dough from turning dry. Notes: This dough gives the best result and the modaks made from this dough retain moisture and stay soft and fresh for more than 24 hours. Method 2: Take rice flour in a wide vessel. In a pot, boil water to boiling point (bubbling hot). Carefully add small quantities of boiling water to the rice flour. Ensure that the water is boiling hot when you add it to the rice flour. Otherwise the dough will not get cooked properly. Stir using a flat ladle, mix well, to make a soft, smooth, elastic, half-cooked dough. Be very careful with the amount of water you add. When the dough is tight and soft, stop adding water. Use your hands to roll the dough into a tight yet smooth and elastic mass. Ensure that there are no lumps in the dough. Notes: This dough is easier to prepare. The modaks made from this dough are soft when fresh but tend to get slightly harder after 5-6 hours. Smear sesame oil or ghee on your hands. Take some rice dough (medium lemon sized) into your palm. Make a small ball of the dough and flatten them into small cups using your thumbs. 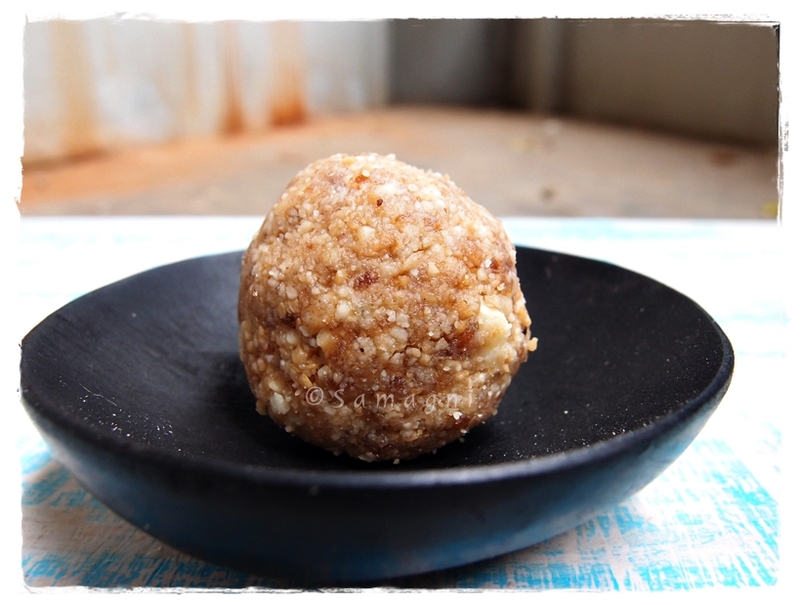 Take a spoon of the coconut jaggery filling and place it in the middle of the flattened dough. Cover the sides while ensuring the filling is safely cocooned with the soft rice dough covering the filling from all sides. Place the dumplings in the steamer/idli tray of a pressure cooker (without weight) and steam for 10-15 mins. Remember to lightly grease the steamer plate/idly tray. After 10-15 mins, turn off the stove, carefully take out the plate/tray of modaks. Wait for a couple of minutes before you touch them because they would be delicate due to all the steam and and heat and tend to break easily. Let them cool off a bit and take out gently and place on a serving plate. This is a delicious and healthy dessert as it is steamed and oil usage is minimal. Always make the filling first then make the dough for the outer covering. This ensures that the rice dough does not get dried up. Remember to lightly grease the steamer plate/idly tray in which you arrange the modaks for steaming. This ensures that they don’t stick to the plate. After the modaks are steamed, turn off the heat and take out the plate/idly tray of modaks. Let it cool off a bit. Wait for a couple of minutes before you touch them because they would be delicate due to all the steam and and heat and tend to break easily. The filling by itself is delicious and hard to resist. Modakam moulds are available in the market these days. Those of you who have trouble making the rice cups can try out the modakam mould.